AMRITSAR is a city of many facets. It has a unique ambience. Its warm flavour and its verve is projected through the lifestyle of its residents Its food, culture, hospitality, shopping, temples, and, of course, its narrow and labyrinthine streets are a nostalgic trip down the memory lane. IT is more than kingsize and half-a-century-old. The unique giant jute-woven ‘manja’ (cot) lying in the open at the once-famous Khoti Bazaar near the telephone exchange here is nearly 20 feet long and 16 feet wide. The cot has withstood the test of time and bears a silent testimony to the progress of the Prajapat community that used to make pottery. A ‘manja’ for all seasons: The community cot measures 20x16 feet and is 50 years old. DEVELOPMENT still evades Anngarh, situated on the outskirts of the city. Anngarh came under the municipal corporation some three decades back. EVEN as pilgrims visit Shree Durgiana Tirath to have a glimpse of its serene and immaculate beauty, the managing committee of the shrine has undertaken the work of gilding the domes and the main pillars of the sanctum sanctorum. The first phase of gold plating with three kg of gold has been completed in a record time of one month. GATKA, the Sikh martial art, as old as the transformation of Sikhs into a martial community, is fast fading into oblivion. With changing times, it is now restricted to a limited sphere of nagar kirtans (religious procession). Its purpose has changed from preparing Khalsa soldiers to merely performances in nagar kirtans on holy occasions. So much so that the martial art has now been confined only to a few state gurdwaras. IT was his missionary zeal to give free guidance in English language that made Mr Ashoka Rao leave his lucrative teaching job in Dharwad College, Karnataka. He explains his mission as "a movement against teaching shops that fleece public and hoodwink it with loud claims of imparting fluency in the language". EVEN as the Shiromani Gurdwara Prabandhak Committee (SGPC) has announced its decision to establish Sri Guru Granth Sahib World Sikh University at Fatehgarh Sahib, Mr Rawal Singh, an MTech student of Department of Guru Ramdass School of Planning, Guru Nanak Dev University, Amritsar, has conceptualized a design for the prospective university. PAINTING is his forte. But it's not just colours that fascinate him. He wants to depict reality through his art. Tejwant Singh believes that painting is a creative expression of "raw emotions". ALTHOUGHlthough the firecracker units in Anngarh have become a source of employment for residents of the area, most of these units are illegal, as they operate in violation of the explosive act and also without obtaining the requisite licence. Roughly only about five persons in the whole village are reported to possess licence to manufacture firecrackers. NOTORIOUS for smuggling and manufacturing illicit liquor, the infamous area has emerged as mini-Shivakasi, where the majority of the residents have adopted the trade of manufacturing firecrackers. AMRITSAR is a city of many facets. It has a unique ambience. Its warm flavour and its verve is projected through the lifestyle of its residents. Its food, culture, hospitality, shopping, temples, and, of course, its narrow and labyrinthine streets are a nostalgic trip down the memory lane. Historian V.N. Datta sums up the versatility of the pulsating city when he says, "To the nationalist, it is a place of inspiration and memory; to the religious, of pilgrimage and reverence for the past; and to the business-minded, it is a flourishing market. In Ranjit Singh's time, it witnessed the splendour of Oriental courts and provided a curious blend of culture and intrigue …"
As contrasted with cities like Varanasi and Delhi, what is striking about Amritsar is not its antiquity but its rapid and sustained transformation into a modern city, its warmth and dynamism, says Prof Datta. With the passage of time, Amritsar, which remained for over a century the first mart in Punjab and the commercial emporium of northern India, witnessed many changes. The nightmarish "dark days" of militancy are now the thing of the past and ‘ happy days are here again.’ This is a tribute to Amritsaris. No city in north India can match the fervour or the fanfare with which festivals are celebrated in Amritsar. However, Lahore and Amritsar, which were considered twin cities with a similar language, culture and food habits, were separated after the Partition. In fashion, too, Amritsaris have always been trailblazers. Girls and women of the city have acquired expertise in applying exquisite and stunningly attractive henna on hands. The mushrooming of jewellery shops is a testimony to the fact that people here have a special love for ornaments. Artificial jewellery is also manufactured here at a large scale. American diamonds and Kundan jewellery have become a hit in markets. The ornaments, manufactured locally, have attracted buyers from various parts of the world. The city boasts of a number of sehra-making shops. The sehra is worn by a groom till the wedding is solemnised. 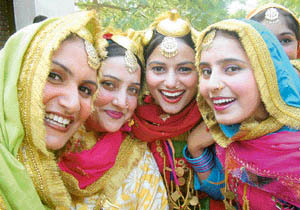 Phulkari is still in great demand in Amritsar. Houses here are decked up with diyas and candles not only on Divali but also on Gurpurabs, Janamashtmi and other festivals. Interestingly, the Holy City has the highest consumption of desi ghee and butter in the state. Puris, paranthas and gur da karah, samosas and kachauris, made of desi ghee, are available at eating joints here. These snacks are sold at "no-profit-no-loss" by the Durgiana Committee and Mata Da Mandir and other temples of the city. Though this is the city of Verka Ghee, yet the monthly sale of Amul Ghee is said to be about Rs 50 lakh, while its consumption in Ludhiana, which has relatively more population, is much less. It is said that nobody dies due to starvation in Amritsar, though many may die due to "over-eating". This is perhaps the reason why multi- specialty hospitals like Escorts and Fortis have found their footholds in Amritsar. Aminchand Sodha Company, dating back to 1911, is perhaps the oldest in the city. The shop is famous for its lemonade, milk soda, pista milk, badam milk. The Amritsari kulfi is available in the famous Hall Bazaar, Lawrence Road zand many shops of the walled city. The delectably refreshing kulfi, made of pista, kesar, elaichi and pure milk, is available at an affordable price. Many sweet shops of the city have become household names in other parts of the country. Visitors and pilgrims who throng the city don't forget to enjoy delicacies of the holy city. Traditional Amritsari cuisines like tandoori chicken (roasted chicken), kulcha chole, puri, lassi, pappad-wadian have become part of the Indian cuisine. A number of chicken shops, popular for various items of chicken and meat, are located in almost every nook and corner of the city. If Surjit Chicken and Chawla Chicken at Lawrence Road are famous for their butter chicken, Bira Meat Shop at Majitha Road flaunts its specialty in roasted chicken and keema naan. Fish shops also dot the walled city. Kulcha chholle is a unique item of Amritsar. Almost all areas here have at least one famous kulcha shop. People flock the shops from morning till noon to enjoy the delicacies. Puri chole is another famed breakfast item of the city. Kanhaiya, Bansal, Novelty, Kanahya are some of the shops which attract customers from far-flung places. Some of these shops have given franchise outside Punjab. 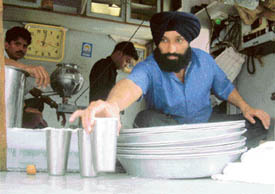 Punjabis' love for lassi can best be seen at the shops of Gian Halwai and Ahuja Lassi Wala. Unmindful of the changing weather, people of all age groups can be seen thronging these shops and gulping down lassi that is tastefully covered with a thick layer of butter and cream. Amritsari pappad-wadian are not only famous all over the country but are also exported to other countries. Mr Narinder Singh, a merchant of Pappad Wadian Wala Bazaar, said these two items were available in the market in the range of Rs 40 per kg to Rs 200 per kg. He said these items were well liked for their spicy taste and a distinct flavour. As night approaches, it's time to savour favourite parantha with mah ki dal and channe, that are available in the unique Amritsari flavour here. The 98-year-old Kesar Da Dhaba is a well-known name here. Celebrities like late Indira Gandhi, Yana Gupta, Manpreet Brar, Liza Ray, Yash Chopra, Uttam Singh visited the dhaba from time to time. Bharawan Da Dhaba and Kundan Dhaba are the other old eating joints. 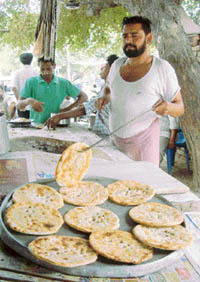 Mr Vijay Singh, better known as Babi Pehalwan of the dhaba, said parantha, mah ki dal and chholle are in great demand. Well, the city does have a lot to offer on different scores. If it's the hub of culture, it's also the centre of gastronomical delights and fashion flavours, not to mention its heritage status! Amritsar retains a sort of nostalgia about it. A unique ambience pervades its "katras" and "deoris", its "chowks" and "mohallas", its "havelis" etc Even at 5 am you breathe the aroma of breakfast near Haathi Gate or outside the Golden Temple and the Durgiana Mandir. I discovered a new life here. Its colourful history and acceptance of the worst with a gay abandon, have cast over it a special aura. Hats off to the spirit of Amritsaris! For any city to be attractive for people to settle down, it should have features to provide homely comforts. It should meet people's spiritual, mental, cultural, physical, recreational and financial needs. And Amritsar has everything to offer to its residents and tourists as well. The cot dates to the pre-Partition days, according to Dr Bhim Sen, a noted physician in the area. "It has become more of a landmark," says Ms Usha Tandon, also a resident of the area. With many repairs and re-weavings over the years, the community has kept the bed in good condition. Mr Atam Singh, an 80-year-old who has been a witness to the glory of the bed for years together, proudly informs that the bed has been kept in good condition by making yearly contributions. "This year we spent Rs 11,000 for its repair and weaving." Mr Gian Chand (87), another veteran, says the community here has special attachment to the bed. The old sit there in evenings and early mornings to exchange the day's news and gossip amidst sips of hot tea. "The cot has served to keep intact the special bond between Hindus and Sikhs," he adds. 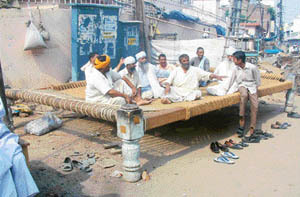 Winters, too, make the ‘manja’ a fine meeting point for the old to enjoy the sun in the chilly cold. Having borne the weight of many a stalwart in the community, the bed is strategically placed opposite the community's "Roor Singh di Haveli" that is more of a lane with an ornate entrance that gives way to houses on both sides accommodating about 1000 members of the community. Indulging in any socially unacceptable activity like drinking, smoking, playing cards, is not allowed there. "For that, we have a separate divan," an octogenarian points out. The ‘manja’ is "sacred", they insist, while lounging on the bed. The only connecting bridge in the area is reported to be sinking on one side. The absence of guards on either side of the bridge is the cause of many accidents in the area where vehicles are known to have fallen in the Ganda Nullah below. The nullah carries sullage, paving a perfect breading ground for mosquitoes and other disease-causing insects in this area, which is popularly known as "mini- Shivakasi", due to a number of cracker-manufacturing units here. The garbage heaps remain strewn about for days, even as the area is notoriously associated with bootlegging. Thanks to the apathy of politicians and district administration, the area has no regular supply of drinking water. The majority of the streets are not metalled, while lack of proper sewage system has made life difficult for residents. The municipal corporation has taken no steps to streamline the garbage disposal by crackers units. It has done little to clean the Ganda Nullah that contaminates the water supply and the ground water. "We have to keep electricity fans switched on even in winters, as mosquitoes keep swarming here," said Mr Laddar. Broken electricity poles were not repaired and this could lead to serious accidents any time, he added. Another resident Savinder Singh said that the area did not have functional streetlights. A number of anti-social activities were also reported from the area, he added. When contacted, Mr Sunil Datti, Mayor, said that a project for the overall development of Anngarh had been passed with an initial amount of Rs 15 lakh. 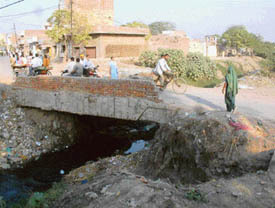 He said the streets and the roads of Bangla Basti had been built near Anngarh. He added that the nullah would be covered and the maintenance of the bridge would be a priority. A view of the Durgiana Temple. The Durgiana Temple derives its name from Goddess Durga. This connection with Goddess Durga has a socio-cultural reference, as Goddess Durga is usually invoked for protection and health when the soldiers go to war. Shree Lakshmi Narayan Mandir is another sacred place in the Durgiana complex. Surrounded by the holy waters, the temple is linked to the main complex by a two-lane causeway. The Sheetla Mata Mandir is perhaps one of the oldest temples in the city. Bara Hanuman Mandir, is another famous temple. Both these are situated in the Durgiana complex. EVEN as pilgrims visit Shree Durgiana Tirath to have a glimpse of its serene and immaculate beauty, the managing committee of the shrine has undertaken the work of gilding the domes and the main pillars of the sanctum sanctorum. The first phase of gold plating with three kg of gold has been completed in a record time of one month. In all, about 40 kg of gold would be used in five phases. The cost of this would be to the tune of Rs 3 crore. The renovation of the causeway, Mata Dhanwant Kaur Dharmshala and the Parikarma and the widening of the entrance gate, apart from the installation of a water re-charging plant, are the major projects undertaken by the management. However, like the SGPC, Durgiana Committee, too, has been in the thick of controversies for one or the other reason. The management had to dispose of its "surplus land" purchased by the previous committee to carry out the work of gold plating. Mr Surinder Arjun, working president of Durgiana Committee, alleges that the previous committee had purchased land in the low-lying area to "please" certain leaders. The Congress-led management took the charge from the previous BJP-led management on court orders. Observers say that instead of inviting seers or sages, the present committee has preferred to invite Chief Minister and Prime Minister to launch prestigious projects. Chief Minister, Capt Amarinder Singh, launched the gilding of the shrine by performing "Patra Pooja" on August 18. GATKA, the Sikh martial art, as old as the transformation of Sikhs into a martial community, is fast fading into oblivion. With changing times, it is now restricted to a limited sphere of nagar kirtans (religious procession). Its purpose has changed from preparing Khalsa soldiers to merely performances in nagar kirtans on holy occasions. So much so that the martial art has now been confined only to a few state gurdwaras. The lack of political patronage has relegated it to a forgotten art. Experts believe that with the changing times it could flourish as a "sport". From fighting invaders and enemy, the Gatka could test endurance and agility on an international sports turf. "A little effort may go far in reviving the forgotten art". And there are some individuals like Mr Nirmal Singh, who subscribe to this belief. Mr Nirmal Singh has tried to resuscitate this art in Singapore. For this, he has divided it into eight grades. The colour of the headband would establish the grade of the player. This band is named "glory of turban". He developed the traditional Gatka into a "sport" after the Singapore Government restrained him from holding its classes. He said he had to prove to the foreign government that Gatka was associated with the Sikh religion. In his endeavour to get it recognised as a sport he divided it into different levels. After his relentless efforts, he was able to get it approved from the Singapore Government. 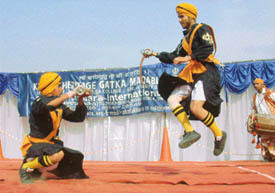 An academy was opened in 2000 by the name of "Sikh Centre Gatka Academy". Under the aegis of the "Sikh Centre Gurdwara Board", this academy runs two gurdwaras there. Such has been his dedication that he had also opened the second centre at California (USA). The academy "Day Area Gatka Academy" enrolls the Sikh children. Mr Hajoora Singh, a local Gatka teacher, informed that the doctrine of warfare was introduced by the sixth Sikh Guru, Sri Guru Hargobind Sahib. The warfare art contributed towards shaping the Khalsa army into a disciplined force. Mr Narinderpal Singh, a senior member of a Gatka group, said that the art had found many takers in the USA, Canada, Germany and the UAE. Ironically, Amritsar being the hub of the Sikhism has only a few Gurdwaras to impart martial art training. 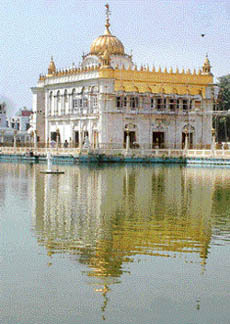 Gurdwara Ram Sar under the patronage of the Shiromani Gurdwara Prabhandak Committee is one such gurdwara. Mr Rao, who holds masters degrees in English and Education, left his home 12 years back to teach language using special methods. "In India, knowing English is considered very important, and proficiency in speaking and writing English gives a person an edge over others, especially in the job market," he says. He has conducted sessions in 16 states, including Delhi, Haryana, Himachal, Uttar Pradesh, Jharkhand, Uttranchal, Maharashtra, Chhatisgarh, Madhya Pradesh, Tamil Nadu. His simplified way of teaching has fascinated students, including those from English medium schools. His method of simplicity and recall is enhanced by the way he weaves a story around the subject. He has delivered lectures at many city schools and colleges. He says that he is not doing this for money. He simply takes whatever an institution offers him. He believes English is the easiest language in the world with only 26 alphabets. Varjit, a student of a senior school, who was part of one of the sessions, says, "Mr Rao makes the most difficult things seem easy and his examples are from everyday life. This makes even grammar seem easy." What makes this concept unique is that the whole design is based on Sri Guru Granth Sahib. This holy scripture has 1430 pages that contain the psalms of six Gurus and the bani of 15 bhagats and 13 bhatts. The site, as designed and planned by Mr Rawal Singh, has been divided into equal parts having the measurement of 1430 ft x 1430 ft, which symbolises 1430 pages of the holy book. As the bani of Gurus, bhagats and bhatts forms the basis of the holy book, the foundations and the pillars of the buildings of the complex have measurements that are the derivatives of the numerals 6,15,13. The height of the Nishan Sahib has been kept at 1430 inches from the foundation. The design of the university makes it a self-sufficient unit stressing upon energy-conscious architecture and adhering to the principles of rainwater harvesting and solar energy conservation. Emphasis has been laid on designing a new system of "modular grid in Sikh architecture", informed Mr Rawal. The entire construction of the campus has been proposed using traditional Nanakshahi bricks and lime mortar. But the two units — vice chancellor's office and administrative office — have been proposed in concrete, as in the whole bani, the emperor or king has not been given much importance. The width of the roads follows the order of 31', 23'-3" and 15'-6", linking all blocks and structures. These are the derivatives of 31, representing 31 ragas rendering the bani in Guru Granth Sahib. Mr Rawal said that Prof S.S. Behal and his thesis guide, Mr Karamjit Singh, had been of tremendous help in conceptualizing the project. He said it took nearly a year of research to make the design possible. 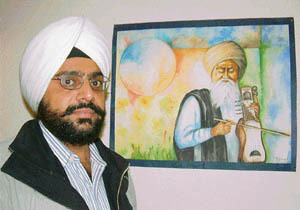 His first exhibition was held in 1988 at local Thakur Singh Art Gallery. The exhibition named "Udas Canvas" created a flutter in the artistic circles of the region. Victims of militancy left a deep mark on him and his paintings show this. He says he took to painting to "clothe his imagination" in colours, forms and figures. He draws his inspiration from everyday life. One of his paintings has been given a place in the Guru Nanak Dev University library, while two more adorn the walls of the assembly hall, Municipal Corporation. One of his art-works titled "crying soul" has been installed at Lalit Kala Academy, Lucknow. Subsequently, he ventured into making book titles, which is closely related to painting. A publishing house in London published two of his book titles. Departing from the traditional way of depicting the image of Guru Nanak Dev, this artist portrayed him in middle age, much against the commonly available portraits of Guru Nanak Dev depicting him in old age. Ms Phoola Rani, a prominent artist and Padam Shree award recipient, described Tejwant's art as "consummate in illustrating psychological aspects of human being". He is now doing experimental work by portraying poetry of Punjabi poets like Surjit Patar, Darshan and Shiv on his vast canvas. Sigmund Freud, a renowned psychologist, and Salvador Dali, a painter, have been a source of inspiration for this artist. ALTHOUGH the firecracker units in Anngarh have become a source of employment for residents of the area, most of these units are illegal, as they operate in violation of the explosive act and also without obtaining the requisite licence. Roughly only about five persons in the whole village are reported to possess licence to manufacture firecrackers. Further, in violations of the act, child labour is being engaged in this extremely dangerous profession. Unmindful of the health hazards, children in the age group of seven to fourteen years are seen handling and making crackers here. Rules state that firecrackers be kept in a shed made of non-inflammable material. But here most of the sheds and stalls use flammable materials like tents with wooden planks to store firecrackers. Although people claim that they have taken precautions such as water storage and sand to deal with an emergency, this seems to be more of a formality. People from far-flung areas come to Anngarh for purchasing crackers. These crackers are exported to other districts of Punjab. This has provided new job opportunities to the unemployed and the illiterate. On festive occasions, especially Divali and Gurpurabs, the area becomes the centre of attraction.